Experienced electrical wholesale company Yesss Electrical, who have over 50 years’ experience in the industry have recently has their new branch based in Hounslow, London undergo a major trade counter refurbishment by Hampshire Mezzanine Floors. Yesss Electrical Ltd have got over 400 branches across Europe, enabling them to deliver the highest possible service to customers all over the globe. Main contractor, Hampshire Mezzanine Floors, who have over 26 years’ experience in complete trade counter fit-outs installed new office and trade counter areas using 75mm sound insulated partitioning with taped and jointed finish and vinyl covering. 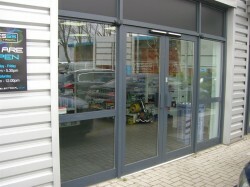 Full height glass partitioning was also fitted with a tinted film finish for the area behind the counter and the manager’s office. Hampshire Mezzanine Floors further installed a one hour fire resisting suspended ceiling under the mezzanine floor and a ceiling over the kitchen and restroom areas to comply with the latest Building Regulations, health and safety requirements. 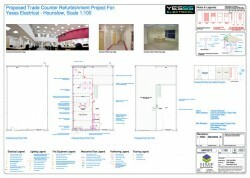 The £55,000 project included the installation of a pull-down security shutter, ceramic flooring, carpeting, toilet and kitchen fit-outs, plumbing and furniture installations for the trade counter area. Hampshire Mezzanine Floors are a principal contractor that carries out the complete fit out for your premises. HMF mainly work in industrial warehouses, commercial premises, factories, retail trade premises and offices. This work often involves the design and installation of mezzanine floors, shelving and racking installations, building works, mechanical and electrical works.